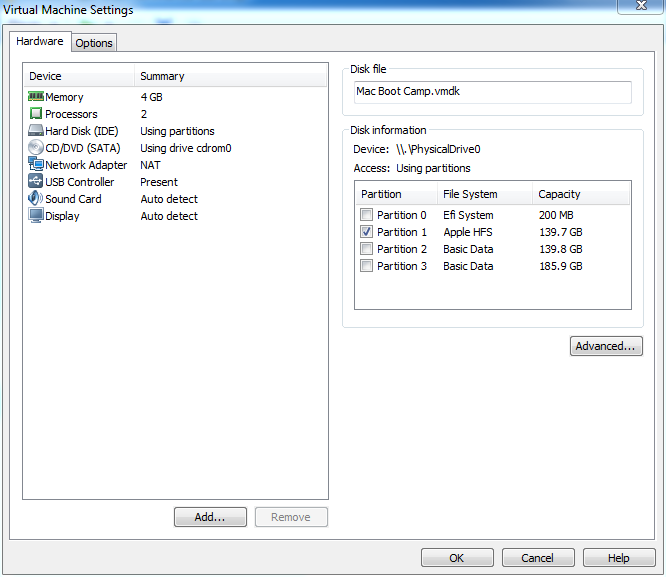 Let’s say you own a mac and you installed Windows into a second partition of your hard drive via Boot Camp, and let’s say you need to access your alternate OS from its partition often but you won’t reboot everytime. Several softwares enable you to do that using OSX as your main OS: Parallels, VMware Fusion, and VirtualBox are just the most known guys out there and all of them have options to boot a vm from a physical installation of Windows. But what if you are in the opposite situation and you’re using Windows as the main OS and want to boot a vm from the OSX installed in the main partition of your hard drive? 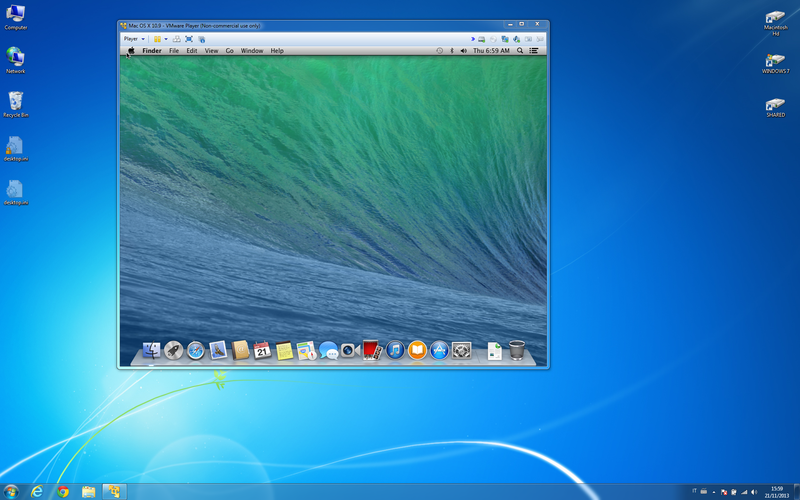 Here’s how I made it possible with VMware Fusion 6 and VMware Player 6 for Windows. NOTE: First of all I’ve to say this is a hack, not something I’d recommend for daily work, moreover remember that there’s your physical installation of OSX inside that vm so don’t mess anything up otherwise you’ll have to fix them the next time you’re booting to OSX. Create an empty OSX VM. Don’t use “Install OSX from recovery partition”, you don’t need a new installation, you’re going to make the VM boot your physical installation, so just create a custom VM. In my case I created it for Mavericks (10.9) and I really don’t know if it works with other versions of OSX. Open Terminal and type “diskutil list” in order to get the list of your partitions, you should get something like this. Choose a name to save that virtual disk configuration and click finish! Now your VM is ready to boot your OSX partition! Just tweak your VM RAM and CPUs to make it usable. I don’t know if it matters in any way but I’ve installed a driver to enable writing HFS+ filesystem from Windows (otherwise it was read only). The driver I use is Paragon HFS for Windows. Once more, this is a hack and I don’t suggest you to use this approach for daily or frequent usage. 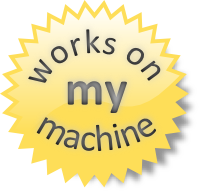 I don’t assure you it works in every machine nor I tried in other machines, it works on mine which is a MBP 6,1 (mid 2010). I’m running Mavericks (10.9) on a mbp version 6,1 and Bootcamp assistant doesn’t let me create install windows from an USB drive. Right click the copy in Utilities folder and click on Show package contents. Now you should be fine if you’re running a system older than Mavericks. The command will print out “Boot Camp Assistant.app: replacing existing signature” then quit. 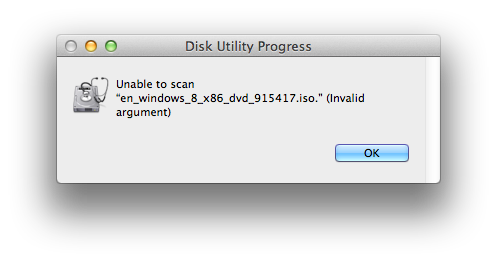 DiskUtility doesn’t let you restore a volume using an ISO image, only DMGs are accepted, otherwise it prompts you an error. when the command ends it prints out a stats report including total bytes transferred and time elapsed. alias showhidden="defaults write com.apple.finder AppleShowAllFiles TRUE && killall Finder"
alias hidehidden="defaults write com.apple.finder AppleShowAllFiles FALSE && killall Finder"
In order to solve the issue on a mac it’s a bit you’ll need to run objcopy… but there’s no objcopy available on osx!!! I worked around it and installed homebrew, a package manager for osx that reminds me ubuntu’s apt. Homebrew is VERY easy to install, just copy\paste the ruby script on your terminal and it’ll download and install everything you need. Moreover it’s the cleanest solution I found so far on a mac because it’s installing ONLY on its directory (and you can choose the directory where you want it set up). Actually there is no brewed formula to install objcopy and objdump (“brew search objcopy” returns nothing) but there’s a formula named “crosstool-ng” which is installing “gobjcopy” and “gobjdump” which are actually the same programs! to create aliases to those programs.